Fergus Wheeler (WJMT), Deynah Doherty, Employee of the Year; Sarah Travers and Cllr John Boyle, Mayor of Derry City and Strabane District Council. The unsung heroes of frontline service provision in communities across Northern Ireland have been celebrated at a gala event in Armagh. Councils throughout the province were represented as the nine award category winners of the 2018 Local Government Awards were announced. Hosted by TV presenter Sarah Travers at the Armagh City Hotel, the awards, co-ordinated by the Northern Ireland Local Government Association (NILGA) and the Association of Public Service Excellence (APSE), attracted an unprecedented 78 entries. Mid and East Antrim Waste Team , Mid & East Antrim Borough Council, won Best Local Authority Service Team:: Back row , Paul O'Brien (APSE), Elaine Smith, Stephen Hogale, Tom Maybin and Sarah Travers. Front row, Ald Gerardine Mulvenna, Anne Donaghy (CEO) and Philip Thompson. Speaking at the event, Councillor Dermot Curran, NILGA president, said: “We’re almost a full electoral term on from the big changes to local government. A huge amount of hard work and vision has gone into modernising councils for local communities, businesses and visitors – as well as meeting needs of wider government and civic society. The awards showcased brilliance in service provision, new initiatives and the personal commitment from councils, councillors, staff and partners. Elected Member Development Initiative winner, Member Development - A Key Driver in Corporate Performance, Derry City and Strabane District Council: Ald Stephen Martin (NILGA), Ellen Cavanagh, Karen Henderson, Sharon Maxwell, Sarah Travers and Cllr John Boyle, Mayor of Derry City and Strabane District Council. Paul O’Brien, APSE chief Executive,said: “Too often the creativity and dedication shown by those who work in frontline services goes unnoticed. This is why these awards are so important. They are a fitting tribute to the resilience and inventiveness of council staff across Northern Ireland who continue to work tirelessly to deliver first-rate services; going the extra mile to add real value to communities. Nominees were judged by an independent panel, the winners in each category were announced at the Gala Awards Recognition Evening which followed the NILGA’s annual conference, ‘Building Sustainable Communities, Delivering a Better Northern Ireland for Everyone’. The Community Planning Initiative was won by MUDC Community Planning Partnership, Mid Ulster District Council: Back row, Derek McKinney, Cllr Martin Kearney, Anthony Tohill (CEO), Cllr Mark Glasgow, Mark Kelso, Kim Ashton and Sarah Travers. Front row, Stephen Reid (SOLACE), Anne Caldwell, Cllr Frances Burton and Cllr Sean McPeake. Best Local Authority Service Team (sponsored by APSE), Mid and East Antrim Waste Team, Mid & East Antrim Borough Council. Best Enterprise Initiative by a Council (sponsored by Enterprise Northern Ireland), Project - Mid Ulster Skills Forum, Mid Ulster District Council. Best Enterprise Initiative was won by Mid Ulster Skills Forum, Mid Ulster District Council: Back row, Derek McKinney, Anthony Tohill, Cllr Martin Kearney and Cllr Mark Glasgow. Front Row, Cllr Frances Burton, Marissa Canavan, Cllr Sean McPeake, Kim Ashton, Michael McQuillan (Enterprise NI) and Sarah Travers. Best Local Authority Community Planning Initiative (sponsored by the Northern Ireland Branch of the Society of Local Authority Chief Executives and Senior Managers), MUDC Community Planning Partnership, Mid Ulster District Council. Best Local Authority Elected Member Development Initiative (sponsored by NILGA), Member Development - A Key Driver in Corporate Performance, Derry City and Strabane District Council. Best Initiative by a Councillor/Councillor Group (sponsored by the National Association of Councillors), Councillor Julie Flaherty, Armagh City, Banbridge and Craigavon Borough Council. Best Local Authority Tourism Initiative (sponsored by Tourism Northern Ireland), Belfast Waterfront, Belfast City Council. Excellence in Environmental Sustainability by a Local Authority (sponsored by Sustainable NI) Environmental Stewardship, Derry City and Strabane District Council. Best Local Authority Design & Build Capital Project (sponsored by Quarry Products Association NI) Newry Leisure Centre Michael Lipsett, Newry, Mourne and Down District Council. The Sustainability award was won Environmental Stewardship, Derry City and Strabane District Council: Andrew Cassells (SNI), Cathy Burns, Cllr Thomas Kerrigan, Sarah Travers and Cllr John Boyle, Mayor of Derry City and Strabane District Council. Best Tourism Initiative was won by Belfast Waterfront, Belfast City Council: Terry McCartney (Tourism Northern Ireland), Iain Bell (ICC Belfast), Ald Tom Haire and Sarah Travers. Best Initiative by a Councillor/ Councillor Group was won by Councillor Julie Flaherty, Armagh City, Banbridge and Craigavon Borough Council: Back row , Ald Junior McCrum, Kevin Savage, Cllr Seamus Doyle, Ald Jim Speers, Cllr Fergal Lennon. 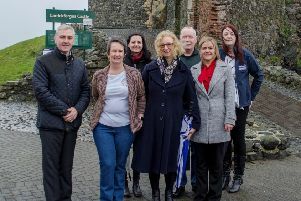 Front row 'Ald Arnold Hatch, Cllr Joe Boyle (NAC), Ald Michael Henderson (NAC), Julie Flaherty, Sarah Travers, Mealla Campbell and Ald Freda Donnelly. Newry Leisure Centre Michael Lipsett, Newry, Mourne and Down District Council, won Best Local Authority Design & Build Capital Project: Back row, Kieran Gordon, Connor Haughey, Cllr Dermot Curran, Cllr Billy Walker, Cllr Terry Andrews and Sarah Travers. Front row, Gordon Best (QPA) and Cllr Oksana McMahon.